At his residence on April 3, 1992 Morris "Mo" Smith age 49 years. Pre-deceased by his wife Noreen (Giroux) Smith. Loving father of Oliver & Margaret Smith both at home. 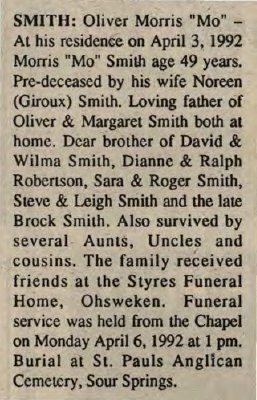 Dear brother of David & Wilma Smith, Dianne & Ralph Robertson, Sara & Roger Smith, Steve & Leigh Smith and the late Brock Smith. Also survived by several Aunts, Uncles and cousins. The family received friends at the Styres Funeral Home, Ohsweken. Funeral service was held from the Chapel on Monday April 6, 1992 at 1 pm. Burial at St. Paul's Anglican Cemetery, Sour Springs.